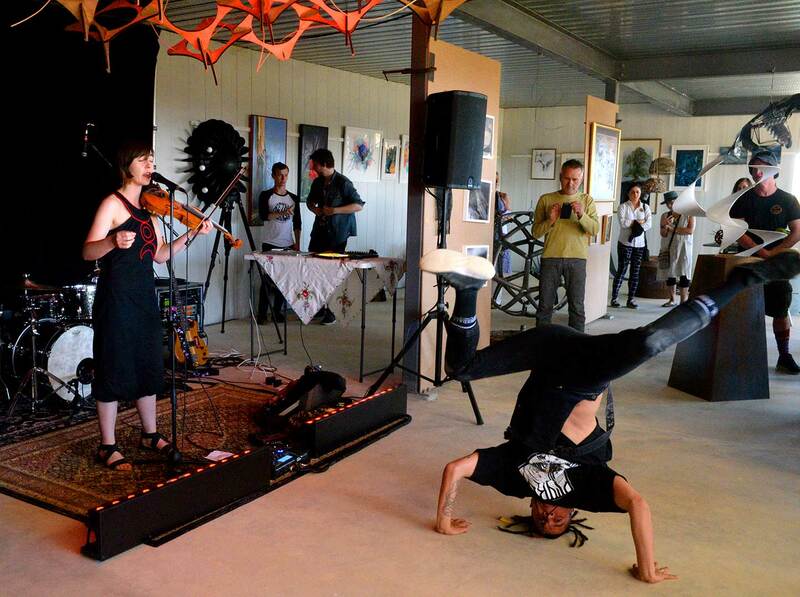 On Saturday 1 December, the Wild Mountain Collective held its Encountering the Wild Multi Arts Festival launch event at Mark O’Carrigan’s complex at Dargan, which includes a cafe, Gallery H and its basement function space. 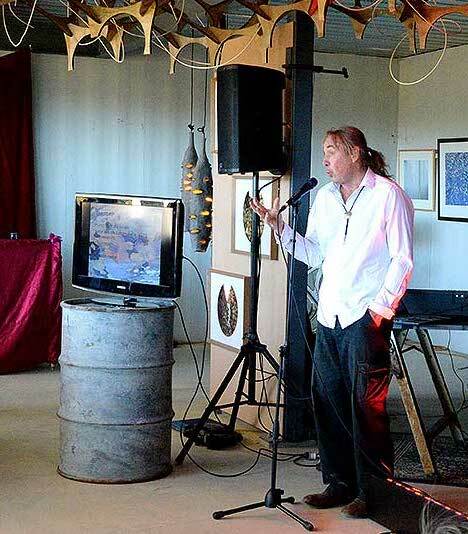 Willem Hendriksen of Retro Rehash sourced the musicians, Simon Hearn sourced the artists, Simon Hearn and Henryk Topolnicki curated the space with artworks and performance space. Mark O’Carrigan hosted the event and helped with site works. Meg Benson undertook the promotion and publicity as well as running the pop-up bar, and Ian Brown looked after our special guests: our keynote speaker, Wayne Brennan, the Aboriginal archaeologist who spoke about rock art and role of art in Aboriginal culture across its 60,000+ years of history, and one of the Wild Mountain Collective’s Patrons, Haydn Washington, an environmental scientist, conservationist and poet from Nullo Mountain. Brad Diedrich, BMCAN’s web designer and media man extraordinaire, came along to take the photographs we see here in this blog post. Ryan Jasper Walsh caught it all on camera for a short documentary he will make available later, when he squeezes in post production editing with his other multiple documentary film projects, including making a campaign film for the Gardens of Stone National Park, stage 2. Barbara Lepani took on the role of overall ring master, including sourcing sponsorship, financing and catering. The biggest shout out goes to Simon Hearn for his combined roles as curator, technician and event co-coordinator involving liaison with artists, musicians, technicians and venue. 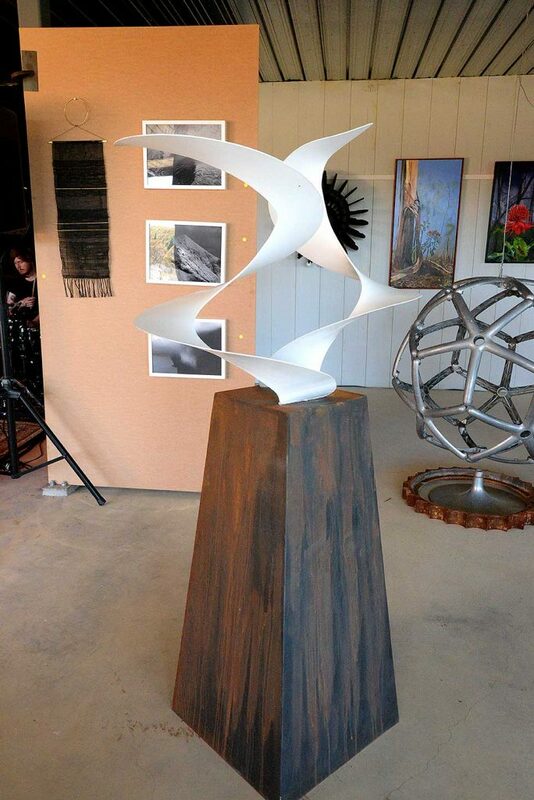 Simon is a Blue Mountains architect at Sunlab Architecture, and a sculptor whose work is exhibited at Gallery H among others. Without the community commitment and hours of voluntary time and effort by people like Simon, and by people like Meg Benson and Ian Brown, events such as “Encountering the Wild” could not happen. We are also grateful to the musicians who took part in the program on the promise of some share of the takings, and to all the artists who brought along their artworks for a short pop-up exhibition, given that the site offered no security for their works for a longer period. 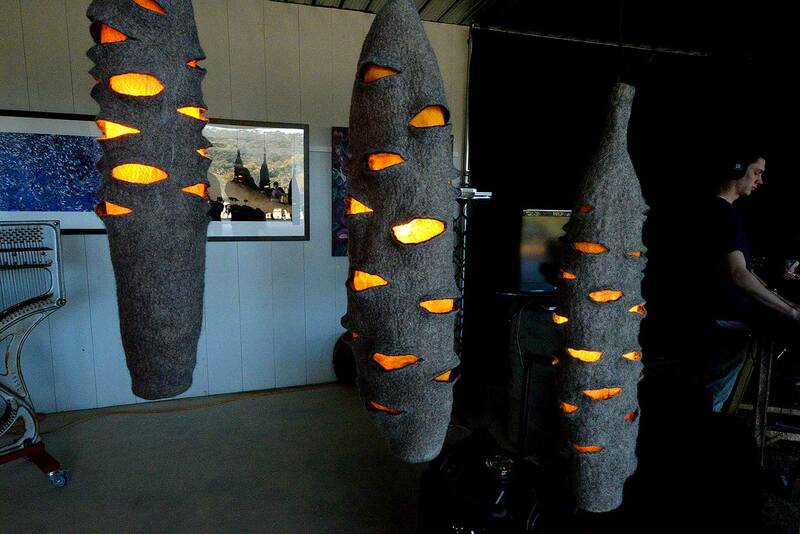 Over 30 artists responded to our callout to take part in the exhibition, with a range of 2D, 3D and multi-media works. 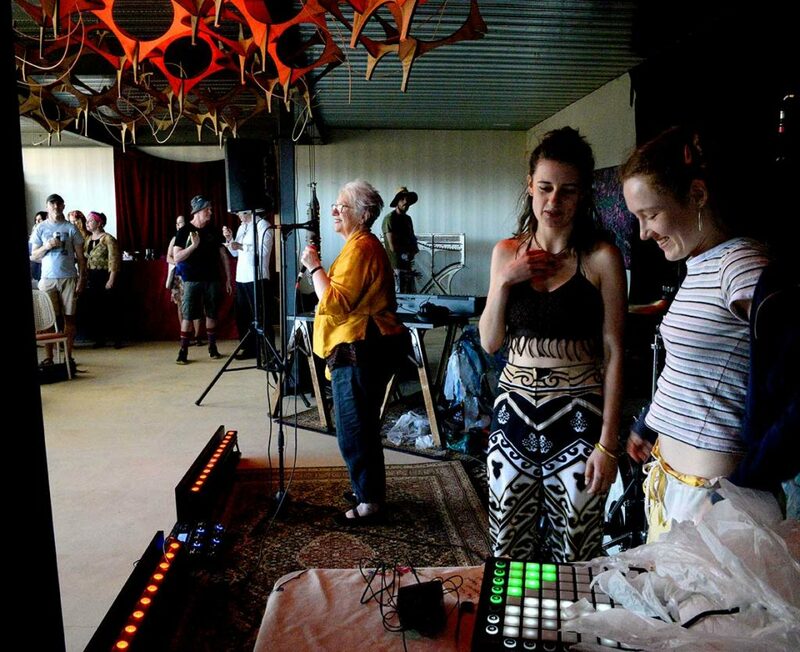 As the Wild Mountain Collective community grows its community of artists and musicians, we look forward to their continued support and active engagement as part of our philosophy of co-creation. With the generous support of a community grant from Bendigo Bank, and beer and cider donated by Young Henry’s, we began our festival with a lunch for the Wild Mountain Collective community and their friends and family. As the cafe didn’t yet have its licensee in place, we called on the Tibetan community in Katoomba to come along with their pop up restaurant to provide momos and curries @$10 per plate. This was complemented by a table overflowing with salads, fruit platters, cakes and biscuits, much of it donated by members, and wine, beer and cider from our pop up bar, served by Meg and Zoe. After lunch the public event began at 2pm with our Patron Haydn Washington introducing our keynote speaker, Wayne Brennan. Wayne took us through the key elements of Aboriginal culture and the way in which rock art played a fundamental role in how Aboriginal people recorded the activities of their Creation Ancestors and the totems of their songlines that criss-cross Australia. Rock art also recorded historical events, including the mega fauna that was contemporary with Aboriginal civilisation during the last Ice Age, and the later arrival of European ships and explorers. Wayne explained how the site where we were holding the event was at a crossroads between several Aboriginal language groups with the Wiradjuri to the west, the Gundungurra to the south and the Darug peoples to the east. The Blue Mountains World Heritage area, which includes six national parks, including the Blue Mountains National Park, the Wollemi National Park and the Gardens of Stone, is very rugged. Accessing rock art sites is difficult and these days archaeologists such as Wayne use helicopters to explore and identify important sites across this rugged terrain. 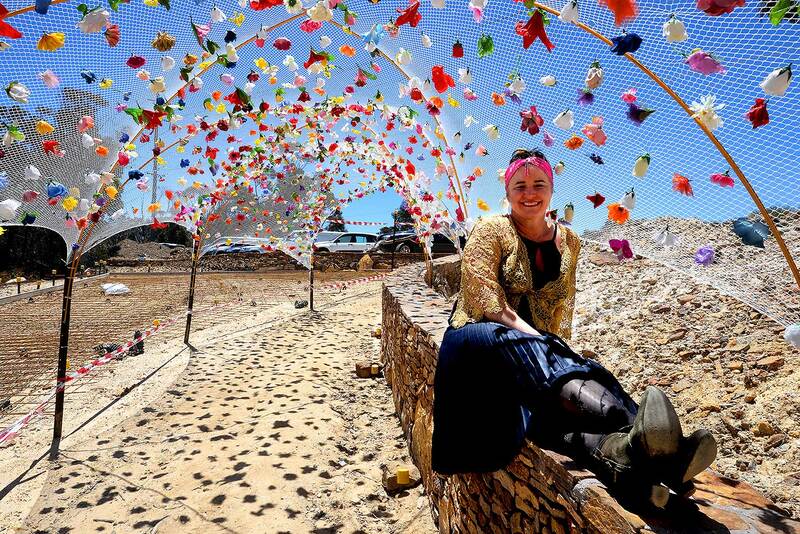 Barbara Lepani, Coordinator of the Wild Mountain Collective project of Blue Mountain Creative Arts Network, then introduced the gathering crowd to the work and aspirations of the Wild Mountain Collective. 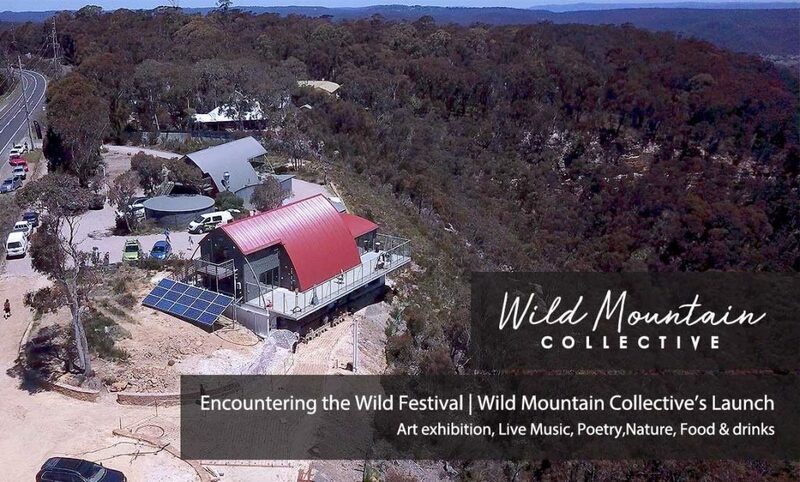 As a community of artists, poets, philosophers, writers and musicians, the Wild Mountain Collective is seeking to deepen our engagement with the ‘more than human world’, through a pivot from the dominant storylines of techno-capitalism to that of an eco-centric worldview. 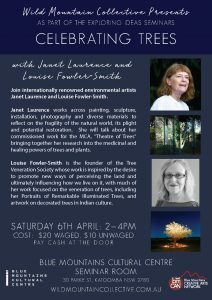 Can this pivot enable us to turn towards the way in which Aboriginal and Torres Strait Island culture used song, story, ceremony and art to deeply feel their sense of inter-being with the natural world? The evolution of Western culture and its worldview has left us feeling separate from this world—lords and masters of it—its fragile and rich bounty there for us to exploit and despoil at our whim. The galloping impact of techno-capitalism since the 19th century Industrial Revolution has brought us to the brink of large scale species extinction, pollution of the air we breathe and the water we rely on, environmental degradation of the land, and the dynamics of climate change that promise to bring extensive devastation to large areas of the Earth. Here beside Barbara you can see Gigi Ray and Georgia Webb of HumUmbra who wowed us with their lyrical music and costumes, while above we can see the Simon’s ceiling sculpture lit up with light. Later we heard rhythm music from the 5-piece Future State band, led by vocalist, Alison Oliver, poetry from Haydn Washington, and a soundscape performance from Sean Botha. As well as photography art and paintings, the highlight of the art exhibition were undoubtedly the large number of standing sculptures complemented by Meg Benson’s canopy of flowers that formed the entrance to the event, and Simon Hearn’s ceiling sculptures above the musician’s performance space. Sculpture highlights included hanging Light Pods by Saskia Everingham, the Soaring Barn Owl by Mark Haynes and Rhonda Castles’ gleaming sculpture. 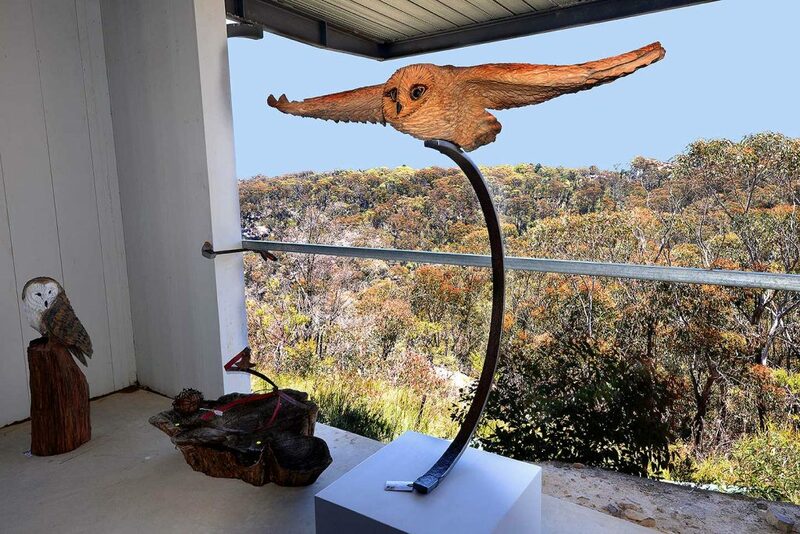 You will be able to find out more about the art works at the exhibition in an article to be published in the forthcoming edition of Oz Art magazine. Curated journeys into the wild with Yuri Bolotin of Bush Explorers at Bilpin. Beautiful, inspiring and significant! I am full of admiration!